You can order your own customized map on request. 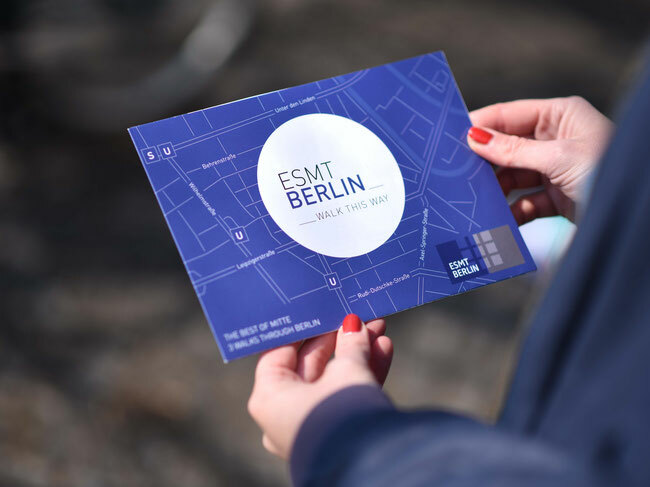 Recently Berta designed a “BertaBerlin map” for the business school ESMT Berlin, crafted so their students and visitors can explore Berlin after the lectures. ESMT Berlin is an international business school offering a full-time MBA, a master’s in management, as well as customized executive education programs. The school was founded by 25 leading global companies and institutions. The international business school offers a full-time MBA, an executive MBA, a master’s in management, as well as open enrollment and customized executive education programs. Berta is the publisher of the travel guide BertaBerlin, a travel blogger and marketer, and most notably a born resident of the German capital city. In her travel guides, inconspicuously entitled BertaBerlin, she discovers city walks all over Berlin and writes about the hidden gems of the city on her blog. There are currently five BertaBerlin maps, one for Neukölln, Kreuzberg, Mitte, QueerBerlin and now BeautyBerlin, with a new yoga map and a map about Charlottenburg planned for spring 2018. You can order your own customized map on request, sponsor a map or simply place an advertisement. Besides the maps their are several marketing packages available.